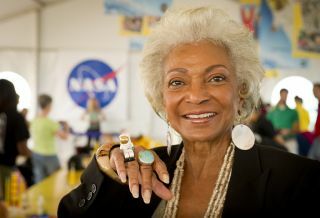 Actress Nichelle Nichols is seen at NASA's Kennedy Space Center in Cape Canaveral, Florida during a 2010 event with LEGO. The "Star Trek" actress, who portrayed Lt. Uhura on the TV series, reportedly suffered an apparent stroke on Wednesday (June 3). Update for Friday (June 5): An MRI showed that Nichols' stroke was minor, the actress' representatives said via her Facebook page Friday. "She will start therapy this morning to evaluate how much damage was done, and try to determine her chances for a full or partial recovery," the Facebook update reads. "The therapists will test her hand at writing and legs to see if she can stand and walk on her own. Last night Nichelle remained alert, and cheerful." Actress Nichelle Nichols, who portrayed Lt. Uhura on the iconic "Star Trek" science fiction TV series from 1966 to 1969 and in six subsequent feature films, has been hospitalized after suffering a stroke. "Last night while at her home in LA, Nichelle Nichols suffered from a mild stroke. She is currently undergoing testing to determine how severe the stroke was. Please keep her in your thoughts," reads a statement posted today (June 4) on Nichols' official Facebook page. Nichols, 82, is a film and TV pioneer; before she began portraying Lt. Uhura, African-American actresses were pretty much limited to playing servants and other stereotypical roles, NASA officials have said. Further, Uhura's kiss with Capt. James T. Kirk (played by William Shatner) during a 1968 "Star Trek" episode is widely cited as one of the first interracial kisses in American television history. Nichols has also helped break barriers in the final frontier. From the late 1970s through the late 1980s, she worked for NASA, recruiting candidates for the agency's astronaut corps. Many of her recruits were women and minorities, NASA officials said — including Guion Bluford (the first African-American astronaut) and Sally Ride (the first American woman to reach space). In 2014, Nichols recorded a video for NASA's Orion space capsule, which launched on its first unmanned test flight last December. News of Nichols' stroke makes an already rough year for "Star Trek" fans even tougher. Actor Leonard Nimoy, who portrayed the Vulcan Spock, died in February at the age of 83.